Wouldn’t you love to pick the brain of your favorite garden authors and experts? You know…Ask them about their top garden advice and get their perspective. It would be invaluable, right? Well, you’re in luck – because THAT’S what this episode is all about! If you could go back in time, what would you tell your younger gardener-self? What do you know NOW, that you wished you knew THEN? I got 8 completely different answers! I summarized ALL the advice into a 2-page PDF for you. (And I threw in a few extras that are NOT on the episode). Click the box below to get the free PDF. 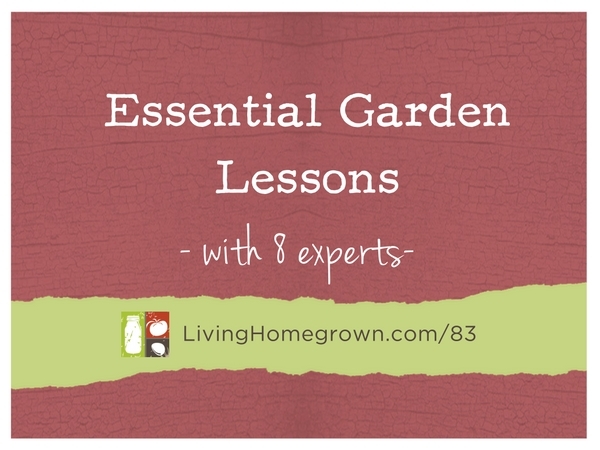 Here’s a full listing of all the guest experts who shared their gardening wisdom on this episode. Here’s a PDF summary of ALL the expert tips – PLUS a few extras that are not on the episode! I wish I had understood how important the soil is as the first step in planting anything. I had many failures when I was younger and thought I was a bad gardener, but looking back I can see that I just didn’t understand the soil I was gardening in and was trying to make it grow things that needed a little more than that soil could give. Ahh yes – so true. I don’t think most garden books or articles stress it enough! LOVED this podcast. I love all of them, but I really enjoyed listening to this episode. The lesson that resonated with me the most were the ones regarding taking care of the soil (and the comparison to junk food). It was a lesson that took a few years to sink in with me. Especially, not relentlessly amending the soil with every item that the big box garden stores sell. Good grief. Expensive and worthless. Since we move so much, I don’t compost…. but I think I’m going to start anyway (what will it hurt?). I just need to – if only to ecologically dispose of kitchen and garden “waste”. I’m currently nourishing the soil with purchased compost (animal manure and scraps – fish heads and guts is the first choice here) but more importantly biochar to help my sandy soil hold nutrients better (and longer). Ok…. I’ve written more than you probably want. 🙂 I love your “show” and look forward to them every week. “See” you soon. – Aloha! Thanks Dana! So glad you liked this one. Theresa this was excellent. Nothing like gardening basics to get you moving in the right direction. When I was young I read or bought every gardening book I could get my hands on. Thinking back it was my Grandparents on both sides that got me first interested. My Dad’s folks were truck farmers and my Mom’s folks were home gardeners. They never made it seem hard in any way to garden (except for the upkeep) and the harvest made it all worthwhile. When I picked green beans and was sitting down to eat them in less than 30 minutes it was amazing and I was hooked. Thanks to people like you and Joe I am getting into sustainability and know firsthand how well this all works. Are you going to ask what the second piece of advice is for a later podcast? I would listen. Keep up the great work. That’s a great idea Craig. I just might have to do another episode. Thanks for the great feedback. This was a very good podcast. I learned so much about the soil and plan to implement as many ideas as I can. Thank you so much for putting this together.